For anybody who was a child in the 1970s and watched his death-defying leaps over buses and other mind-bogglingly risky motorcycle stunts on television, Evel Knievel was nothing short of a legend and an iconic figures that seems to define that era. 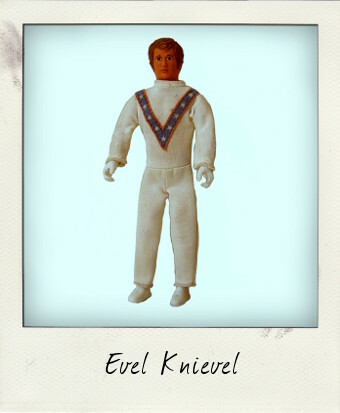 My sister and I were huge fans, yet this 6-inch Evel Knievel action figure by Ideal Toys never made it into our toybox as kids, so I was really pleased to track one down recently online. As well as the sheer lunacy of some of the daredevil stunts that Evel Knievel attempted, he was also famous for the number of bones he broke in some of his more spectacular crashes. Ironically, the 1972 Evel Knieval action figures were not, strictly speaking, action figures at all, having zero points of articulation - they were, instead, bendy figures made of soft rubbery plastic constructed over wire. Given the plethora of Evel Knievel Vehicles that came with the figure in the years that followed – a Stunt Cycle, Chopper, Dragster and Canyon Sky Cycle to name but a few – that would see the Evel figure hurtling through the air and crashing on bedroom floors on over the world – a bendy, almost unbreakable figure, was surely an inspired choice! Evel Knievel wore distinctive red, white and blue leathers and Ideal replicated them nicely in a fabric jumpsuit. The suit may have yellowed a little over the last thirty years, but on the whole this much sought-after figure is in pretty good shape and the paintwork on the face is reasonably intact. The head, feet and hands are, in fact, the only areas of the figure molded in hard vinyl. There were further variations of the figure too – he was available in red and blue suited versions, as well as a rescue and racing suit – but for me this is the definitive Evel Knievel as I remember him. Now all I need to do is track down a helmet and belt! Wow nice pick up DEBS!He’ll look great on display!